Returning favorites include Feast of the Three Kings, American Holiday Table, the France Holiday Kitchen (renamed for this year), Bavaria Holiday Kitchen in Germany, and more. Check out all of the menus for the Holiday Kitchens at the Disney Food Blog! Guests can also take part in a Holiday Cookie Stroll this year, tracking the purchase of five select cookies in the Festival Passport, and then visiting the Holiday Sweets and Treats booth for a complimentary completer cookie. The 2018 Epcot Festival of the Holidays runs from November 18 through December 30. 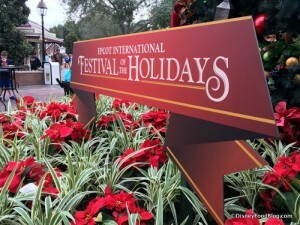 For the most up-to-date Festival information be sure to visit the Disney Food Blog’s 2018 Epcot Festival of the Holidays page.